For other uses, see Island (disambiguation). A small island in Lower Saranac Lake in the Adirondacks, New York state, U.S.
Bangchuidao Island is an islet composed mostly of rock, in Dalian, Liaoning Province, China. The islands of Fernando de Noronha, Brazil, are the visible parts of submerged mountains. Manhattan [island], U.S. is home to over 1.6 million people. Kansai Airport is built on an artificial island in Japan. An island or isle is any piece of sub-continental land that is surrounded by water. Very small islands such as emergent land features on atolls can be called islets, skerries, cays or keys. An island in a river or a lake island may be called an eyot or ait, and a small island off the coast may be called a holm. A grouping of geographically or geologically related islands is called an archipelago, such as the Philippines. An island may be described as such, despite the presence of an artificial land bridge; examples are Singapore and its causeway, and the various Dutch delta islands, such as IJsselmonde. Some places may even retain "island" in their names for historical reasons after being connected to a larger landmass by a land bridge or landfill, such as Coney Island and Coronado Island, though these are, strictly speaking, tied islands. Conversely, when a piece of land is separated from the mainland by a man-made canal, for example the Peloponnese by the Corinth Canal or Marble Hill in northern Manhattan during the time between the building of the United States Ship Canal and the filling-in of the Harlem River which surrounded the area, it is generally not considered an island. There are two main types of islands in the sea: continental and oceanic. There are also artificial islands. The word island derives from Middle English iland, from Old English igland (from ig or ieg, similarly meaning 'island' when used independently, and -land carrying its contemporary meaning; cf. Dutch eiland ("island"), German Eiland ("small island")). However, the spelling of the word was modified in the 15th century because of a false etymology caused by an incorrect association with the etymologically unrelated Old French loanword isle, which itself comes from the Latin word insula. Old English ieg is actually a cognate of Swedish ö and German Aue, and related to Latin aqua (water). Greenland is the world's largest island, with an area of over 2.1 million km2, while Australia, the world's smallest continent, has an area of 7.6 million km2, but there is no standard of size that distinguishes islands from continents, or from islets. There is a difference between islands and continents in terms of geology. Continents are the largest landmass of a particular continental plate; this holds true for Australia, which sits on its own continental lithosphere and tectonic plate (the Australian plate). By contrast, islands are either extensions of the oceanic crust (e.g. volcanic islands), or belong to a continental plate containing a larger landmass; the latter is the case of Greenland, which sits on the North American plate. Continental islands are bodies of land that lie on the continental shelf of a continent. Examples are Borneo, Java, Sumatra, Sakhalin, Taiwan and Hainan off Asia; New Guinea, Tasmania, and Kangaroo Island off Australia; Great Britain, Ireland, and Sicily off Europe; Greenland, Newfoundland, Long Island, and Sable Island off North America; and Barbados, the Falkland Islands, and Trinidad off South America. A special type of continental island is the microcontinental island, which is created when a continent is rifted. Examples are Madagascar and Socotra off Africa, New Caledonia, New Zealand, and some of the Seychelles. fluvial or alluvial islands formed in river deltas or midstream within large rivers. While some are transitory and may disappear if the volume or speed of the current changes, others are stable and long-lived. Islets are very small islands. Oceanic islands are islands that do not sit on continental shelves. The vast majority are volcanic in origin, such as Saint Helena in the South Atlantic Ocean. The few oceanic islands that are not volcanic are tectonic in origin and arise where plate movements have lifted up the ocean floor above the surface. Examples are Saint Peter and Paul Rocks in the Atlantic Ocean and Macquarie Island in the Pacific. One type of volcanic oceanic island is found in a volcanic island arc. These islands arise from volcanoes where the subduction of one plate under another is occurring. Examples are the Aleutian Islands, the Mariana Islands, and most of Tonga in the Pacific Ocean. The only examples in the Atlantic Ocean are some of the Lesser Antilles and the South Sandwich Islands. Another type of volcanic oceanic island occurs where an oceanic rift reaches the surface. There are two examples: Iceland, which is the world's second largest volcanic island, and Jan Mayen. Both are in the Atlantic. A third type of volcanic oceanic island is formed over volcanic hotspots. A hotspot is more or less stationary relative to the moving tectonic plate above it, so a chain of islands results as the plate drifts. Over long periods of time, this type of island is eventually "drowned" by isostatic adjustment and eroded, becoming a seamount. Plate movement across a hot-spot produces a line of islands oriented in the direction of the plate movement. 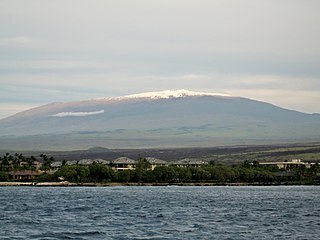 An example is the Hawaiian Islands, from Hawaii to Kure, which continue beneath the sea surface in a more northerly direction as the Emperor Seamounts. Another chain with similar orientation is the Tuamotu Archipelago; its older, northerly trend is the Line Islands. The southernmost chain is the Austral Islands, with its northerly trending part the atolls in the nation of Tuvalu. Tristan da Cunha is an example of a hotspot volcano in the Atlantic Ocean. Another hotspot in the Atlantic is the island of Surtsey, which was formed in 1963. An atoll is an island formed from a coral reef that has grown on an eroded and submerged volcanic island. The reef rises to the surface of the water and forms a new island. Atolls are typically ring-shaped with a central lagoon. Examples are the Line Islands in the Pacific and the Maldives in the Indian Ocean. Approximately 45,000 tropical islands with an area of at least 5 hectares (12 acres) exist. Examples formed from coral reefs include Maldives, Tonga, Samoa, Nauru, and Polynesia. Granite islands include Seychelles and Tioman and volcanic islands such as Saint Helena. The socio-economic diversity of tropical islands ranges from the Stone Age societies in the interior of Madagascar, Borneo, and Papua New Guinea to the high-tech lifestyles of the city-islands of Singapore and Hong Kong. International tourism is a significant factor in the economy of many tropical islands including Seychelles, Sri Lanka, Mauritius, Réunion, Hawaii, and the Maldives. Almost all of the Earth's islands are natural and have been formed by tectonic forces or volcanic eruptions. However, artificial (man-made) islands also exist, such as the island in Osaka Bay off the Japanese island of Honshu, on which Kansai International Airport is located. Artificial islands can be built using natural materials (e.g., earth, rock, or sand) or artificial ones (e.g., concrete slabs or recycled waste). Sometimes natural islands are artificially enlarged, such as Vasilyevsky Island in the Russian city of St. Petersburg, which had its western shore extended westward by some 0.5 km in the construction of the Passenger Port of St. Petersburg. Artificial islands are sometimes built on pre-existing "low-tide elevation," a naturally formed area of land which is surrounded by and above water at low tide but submerged at high tide. Legally these are not islands and have no territorial sea of their own. ^ "Hawaii : Image of the Day". Archived from the original on January 10, 2015. Retrieved January 6, 2015. ^ "Webster's Dictionary-Island". Archived from the original on October 9, 2011. ^ "Island". Dictionary.com. Archived from the original on March 7, 2007. Retrieved March 5, 2007. ^ Ringe, Donald A. (2006). A Linguistic History of English: From Proto-Indo-European to Proto-Germanic. Oxford University Press. p. 109. ISBN 0-19-928413-X. ^ "Island (geography)". Encyclopædia Britannica. Archived from the original on October 8, 2014. Retrieved September 16, 2014. ^ Arnberger, Hertha, Erik (2011). The Tropical Islands of the Indian and Pacific Oceans. Vienna: Austrian Academy of Sciences Press. ISBN 978-3-7001-2738-3. ^ "Building Artificial Islands That Rise With the Sea". Archived from the original on June 5, 2016. Retrieved June 28, 2016. ^ "What Makes an Island? Land Reclamation and the South China Sea Arbitration | Asia Maritime Transparency Initiative". July 15, 2015. Archived from the original on May 27, 2016. Retrieved June 28, 2016. ^ "Conception of development of the artificial lands of Vasilievsky island". Archived from the original on September 25, 2016. Retrieved June 28, 2016. ^ United Nations Convention on the Law of the Sea, Article 13. Archived from the original on September 2, 2017. Retrieved August 25, 2017. Wikisource has the text of the 1911 Encyclopædia Britannica article Island. Listing of islands from United Nations Island Directory. An archipelago, sometimes called an island group or island chain, is a chain, cluster or collection of islands, or sometimes a sea containing a small number of scattered islands. An atoll, sometimes called a coral atoll, is a ring-shaped coral reef including a coral rim that encircles a lagoon partially or completely. There may be coral islands or cays on the rim. The coral of the atoll often sits atop the rim of an extinct seamount or volcano which has eroded or subsided partially beneath the water. The lagoon forms over the volcanic crater or caldera while the higher rim remains above water or at shallow depths that permit the coral to grow and form the reefs. 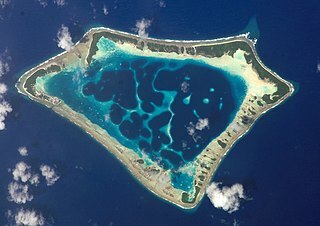 For the atoll to persist, continued erosion or subsidence must be at a rate slow enough to permit reef growth upward and outward to replace the lost height. Iceland is an island country at the confluence of the North Atlantic and Arctic Oceans, east of Greenland and immediately south of the Arctic Circle, atop the constructive boundary of the northern Mid-Atlantic Ridge about 860 km (530 mi) from Scotland and 4,200 km (2,600 mi) from New York City. One of the world's most sparsely populated countries, Iceland's boundaries are almost the same as the main island – the world's 18th largest in area and possessing almost all of the country's area and population. It is the westernmost European country with more land covered by glaciers than in all of continental Europe. 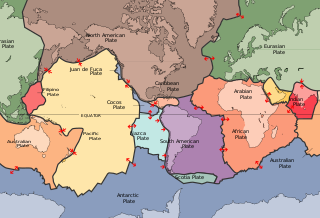 The North American Plate is a tectonic plate covering most of North America, Greenland, Cuba, the Bahamas, extreme northeastern Asia, and parts of Iceland and the Azores. It extends eastward to the Mid-Atlantic Ridge and westward to the Chersky Range in eastern Siberia. The plate includes both continental and oceanic crust. The interior of the main continental landmass includes an extensive granitic core called a craton. Along most of the edges of this craton are fragments of crustal material called terranes, accreted to the craton by tectonic actions over a long span of time. It is thought that much of North America west of the Rocky Mountains is composed of such terranes. This is a list of tectonic plates on the Earth's surface. Tectonic plates are pieces of Earth's crust and uppermost mantle, together referred to as the lithosphere. The plates are around 100 km (62 mi) thick and consist of two principal types of material: oceanic crust and continental crust. The composition of the two types of crust differs markedly, with mafic basaltic rocks dominating oceanic crust, while continental crust consists principally of lower-density felsic granitic rocks. A volcanic arc is a chain of volcanoes formed above a subducting plate, positioned in an arc shape as seen from above. Offshore volcanoes form islands, resulting in a volcanic island arc. 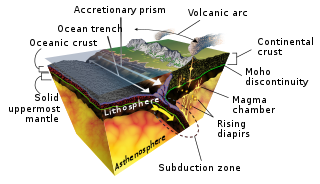 Generally, volcanic arcs result from the subduction of an oceanic tectonic plate under another tectonic plate, and often parallel an oceanic trench. The oceanic plate is saturated with water, and volatiles such as water drastically lower the melting point of the mantle. As the oceanic plate is subducted, it is subjected to greater and greater pressures with increasing depth. This pressure squeezes water out of the plate and introduces it to the mantle. Here the mantle melts and forms magma at depth under the overriding plate. The magma ascends to form an arc of volcanoes parallel to the subduction zone. A large igneous province (LIP) is an extremely large accumulation of igneous rocks, including intrusive and extrusive, arising when magma travels through the crust towards the surface. The formation of LIPs is variously attributed to mantle plumes or to processes associated with divergent plate tectonics. The formation of some of the LIPs the past 500 million years coincide in time with mass extinctions and rapid climatic changes, which has led to numerous hypotheses about the causal relationships. LIPs are fundamentally different from any other currently active volcanoes or volcanic systems. Accretion, in geology, is a process by which material is added to a tectonic plate or a landmass. This material may be sediment, volcanic arcs, seamounts, or other igneous features. The geology of Iceland is unique and of particular interest to geologists. Iceland lies on the divergent boundary between the Eurasian plate and the North American plate. It also lies above a hotspot, the Iceland plume. The plume is believed to have caused the formation of Iceland itself, the island first appearing over the ocean surface about 16 to 18 million years ago. The result is an island characterized by repeated volcanism and geothermal phenomena such as geysers. A volcanic belt is a large volcanically active region. Other terms are used for smaller areas of activity, such as volcanic fields. Volcanic belts are found above zones of unusually high temperature (700-1400 °C) where magma is created by partial melting of solid material in the Earth's crust and upper mantle. 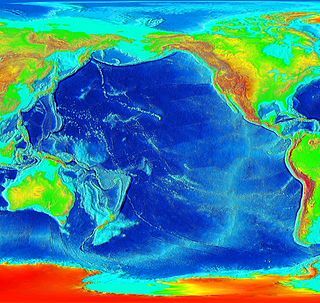 These areas usually form along tectonic plate boundaries at depths of 10–50 km. For example, volcanoes in Mexico and western North America are mostly in volcanic belts, such as the Trans-Mexican Volcanic Belt that extends 900 km from west to east across central-southern Mexico and the Northern Cordilleran Volcanic Province in western Canada. 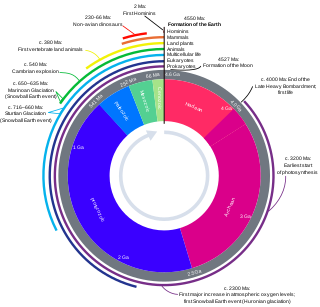 The geological history of Earth follows the major events in Earth's past based on the geological time scale, a system of chronological measurement based on the study of the planet's rock layers (stratigraphy). Earth formed about 4.54 billion years ago by accretion from the solar nebula, a disk-shaped mass of dust and gas left over from the formation of the Sun, which also created the rest of the Solar System. The opening of the North Atlantic Ocean is a geological event that occurred over millions of years, during which the supercontinent Pangea broke up. As modern-day Europe and North America separated during the final breakup of Pangea in the early Cenozoic Era, they formed the North Atlantic Ocean. Geologists believe the breakup occurred either due to primary processes of the Iceland plume or secondary processes of lithospheric extension from plate tectonics. The Pacific Ocean evolved in the Mesozoic from the Panthalassic Ocean, which had formed when Rodinia rifted apart around 750 Ma. The first ocean floor which is part of the current Pacific Plate began 160 Ma to the west of the central Pacific and subsequently developed into the largest oceanic plate on Earth.